The two-time defending 5A state champion Mill Valley Jaguars will have to go through an undefeated KC Schlagle squad to keep their championship hopes alive. Last year, the Jaguars entered the playoffs with a 4-4 record but then rattled off five consecutive wins to capture another state title. Fresh off a 31-7 first-round win over Topeka Seaman, Mill Valley needs four more wins to repeat history. All four of Mill Valley’s losses are to strong teams, falling to St. James Academy, Blue Valley, St. Thomas Aquinas and Bishop Miege. Senior quarterback Brody Flaming directs the Mill Valley offense, passing for 2,113 yards and 18 touchdowns this season. Logan Talley leads all receivers with 65 catches for 855 yards and 10 touchdowns. Evan Rice has 38 receptions for 641 yards and five TDs. Junior Sage Sieperda leads the Jaguar defense with 99 tackles. The Stallions have mostly breezed through their schedule, but they don’t play the quality of competition Mill Valley does in the EKL. 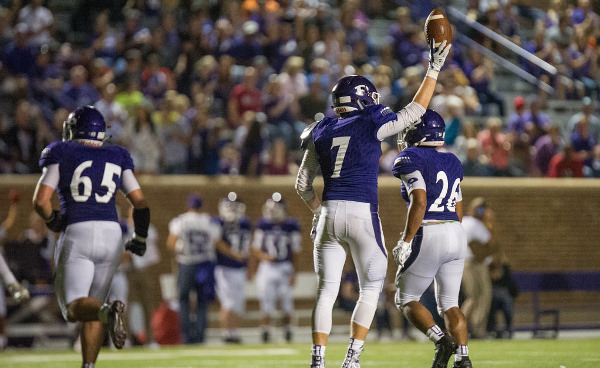 Last week’s 57-16 win was against Highland Park, who finished the season with an 0-9 record. KC Schlagle was the only team in the Kansas City-Atchison League to earn a winning record through the first nine games. Schlagle’s offense begins and ends with the running game. The Stallions rush for 383.2 yards per game, while passing for only 27.9. Senior Ivan Webb has rushed for 2,758 yards and 34 touchdowns on 214 carries. James Hampton leads the defense with 82 tackles, four sacks, and three interceptions. The Stallions opened the 2016 season with an 8-1 record but fell 53-17 to St. James in the second round of the playoffs. Despite the close proximity to each other, Wichita Heights and Maize have not played each other since at least 2004. The teams are in different conferences, though Maize, out of ACVTL Division I, has faced some City League squads in recent years. Maize has been a relative surprise and bumped into the Class 5A rankings in the back part of 2017. The Eagles have not been dominant but have found ways to win. Maize has an average score of 27-17. The Eagles went 7-3 last season with an offense that tallied 30.4 points and a defense that permitted 29.7. In Week 8, Maize ended a 13-game losing streak against Hutchinson with a 14-13 victory. The Eagles beat Topeka West, 52-6, in the first round, while Wichita Heights held off Newton, 41-26. Maize won at Newton, 22-19, in Week 1, beat Goddard-Eisenhower, 13-10, in Week 2 and defeated Campus, 36-26, in Week 6. While perhaps not seen as quality wins at the time, Maize’s victories versus Eisenhower and Campus have significantly grown in stature as both teams remain alive in the 5A and 6A brackets, respectively. Dalyn Johnson has led the Eagle offense with multiple big games, including 254 rushing yards and four TDs against Campus. Quarterbacks Caleb Grill and Camden Jurgensen have helped lead the offense. In Week 4, Johnson had to overcome a sprained shoulder and had 25 carries for 134 yards and three scores versus Salina South. Heights, a preseason top-5 team, opened 0-2 when several players, notably quarterback K’Vonte Baker, missed games. Baker was hurt in a win against Kapaun and then suffered injury in an eventual 35-14 loss in Week 7 to Carroll. Heights (4-2 in City League) was tied with Carroll once Baker exited. Last week, backup quarterback Deante Edwards took over as signal caller, and Baker switched to running back. Edwards passed for three scores, scored on a punt return and rushed for 122 yards. Baker had 151 yards and a pair of touchdowns. The game hinges on Baker’s health. When Baker is on the field, Heights is a top-5 team. The Falcons have scored 19.7 points a contest in the three losses, and 49.8 points a game in the six wins. That includes 34 versus Kapaun, the most permitted by the stingy Crusader defense. Heights last lost in the first round in ’12 and has four straight quarterfinals since. Maize has made it to the quarterfinals or better four times in school history, the last coming in ’06. Maize has enjoyed its best season since an 8-3 mark in ’06, but Heights, assuming Baker can play, has too much firepower.